But… there’s a way to start making over $3000 per month in the next 100 days with the right hustle and knowledge. I was looking around for more SaaS companies to add to my Ultimate list of SaaS Affiliate and Reseller programs post and I stumbled across ClickFunnels. Their marketing quickly grabbed my attention and I decided to check out their Affiliate Bootcamp program and see what it’s all about. I’m very happy I did and I think you’ll be too. The people behind this company, especially the founder Russell Brunson, understand very well how to market, sell or deliver products online by converting traffic into income. Russel has used his ClickFunnels to help people like Tony Robbins sell 1000’s of copies of his book Money. He’s also helped Dave Asprey sell tons of Bulletproof diet books and helped Neil Strauss sell a pile of his recent book, The Game. Watch this short training video to learn the details of this powerful online selling system. A sales funnel is the process where your target audience or customer moves from a place of not knowing your product or services exists to then be taken on an intention focused sales journey to convert them to a prospect and then a customer. Here’s a diagram to show you a simple product sales funnel and the various assets that make up a complete sales funnel. An online sales funnel is usually made up of a lead capture page with a video or text and a form to capture an email. Then a sales page to pitch the product and some follow up email scripts to move leads through the buying process to become customers. And then he shows you how on video for his funnel Friday videos. It’s very cool. ClickFunnels can be used to sell books, physical products like supplements, health products, electronics, tools and digital products like ebooks and software, leads and so much more. The whole idea with ClickFunnels is to be able to make sales funnels as fast and easy as possible. There are 100’s of purpose-built sales funnel templates that help you build out your funnel in minutes. It’s a great marketing tool and they have sold over 70,000 subscriptions because it works and ClickFunnels customers are making millions with it. When you start using clickFunnels, it’s not just about the software either. There is also a ton of great training you can get through books, webinars and courses that teach you strategy before tactical execution. There is also an amazing online community with many other smaller communities all in a few select Facebook Groups. The community wants to help each other grow and there is so much value in the ClickFunnels community. The affiliate program is similar to most SaaS affiliate programs. You promote the product and they pay you a commission on the recurring revenue they get for the life of that customer. The least expensive ClickFunnels plan is $97 a month. On this plan, users get access to all the funnel creation tools, for creating 20 funnels, 100 pages and for 20,000 visitors. These are all setup as sales funnels too so the sub-points below are all of the products included in the sales funnel that will be promoted to the leads that convert on the offers. There are so many ways to make money. As you can see, you don’t need to have your own products to make a money online. Just promote these products and start earning money faster. It works and it can work for you too if you take the time to learn. 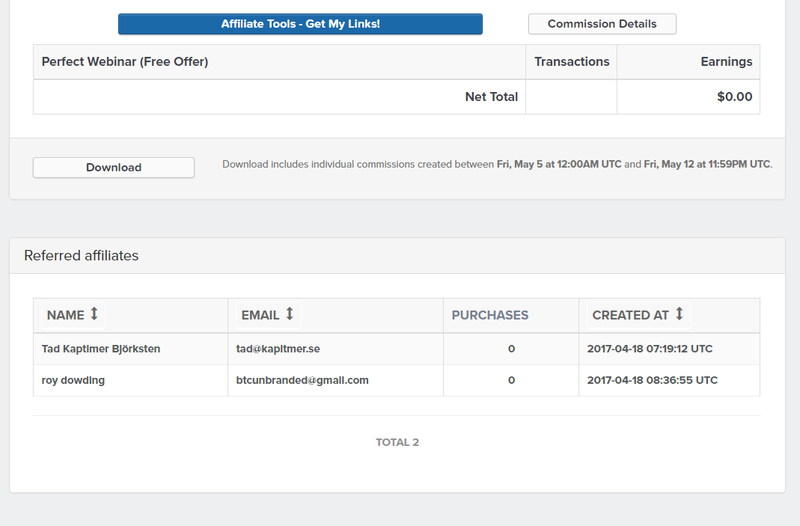 I found great success with the Affiliate Side Hustle Business In a Box. It comes with a Free Done For You (Plug And Play) Affiliate Marketing Funnel and step by step instructions for you to follow. I have watched all of his videos in this free boot camp and there is so much great stuff in here. Much of what you learn in the affiliate Bootcamp comes from the products listed above. Dream Car bonus! What? ClickFunnel also has a bonus for Super Affiliates that can reach their goal in 100 days. 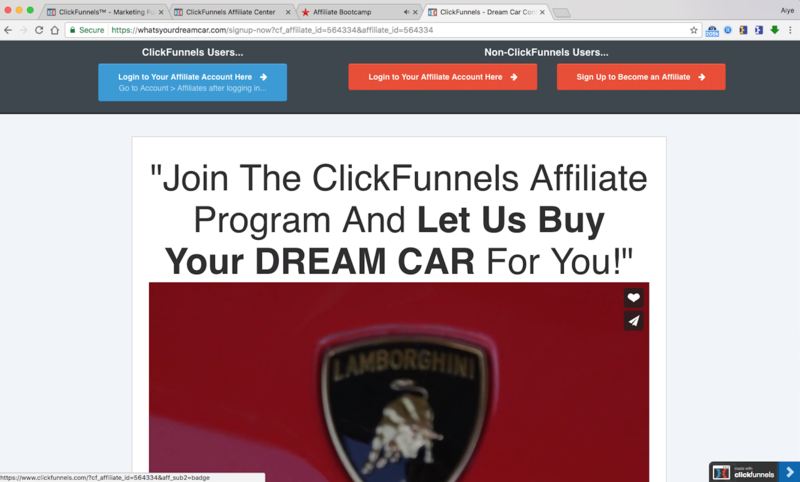 Watch the video below to hear from all of the affiliates who have already won a dream car from ClickFunnels. 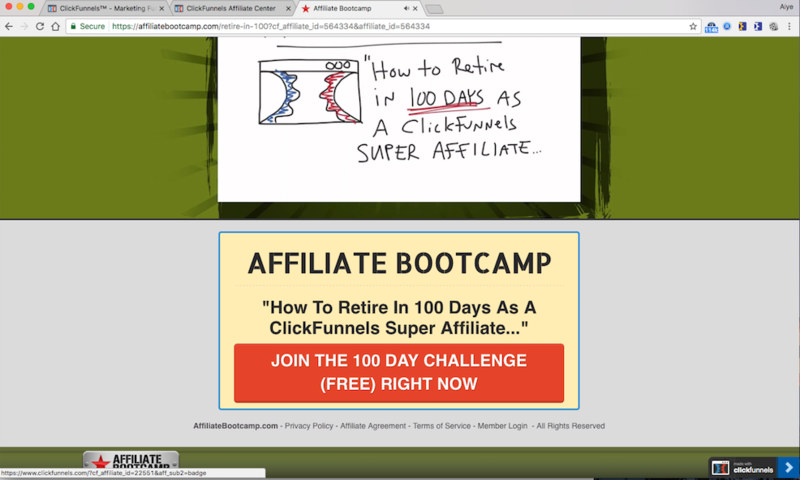 Hi Craig, are you getting signup Referred Affiliates shown on your Clickfunnels Affiliate dashboard when someone sign up through your “Affiliate Boot camp” link? The dashboard only shows commissions not signups. Why do you ask? Try to click on the badge at the bottom right. My Affiliate ID is 564334, but it seems to direct to id=22551. That’s not cool. interesting. Will look into it too. Thank you Craig. Much appreciated. Just messaged Kevin at Clickfunnels. Awesome. Also if you notice for the “expert secrets” link, the badge goes to the affiliate id=22551. I had two of my friends sign up under that link and I didn’t get the credit. I was really surprised when my friend told me he got two sign up. I said where? OMG. I hope someone isn’t highjacking our affiliates. This is from his Affiliate Dashboard. Hi Craig, thanks for this article. I’m curious how your 100 days is going? If the $3,000/mo is realistic? I’m newly researching affiliate marketing and am curious if the Affiliate Boot Camp can work for someone with no current websites etc. Sorry for the late reply. Things are going alright. I haven’t reached the goal yet but people are signing up and I have a few Affiliates in my downline. I do think it’s realistic especially if you’re focusing on this one Revenue stream. I however, I’m not doing that I have other projects on the go but I am working on several campaigns at the moment to help grow my team. I would at least sign up for the Affiliate Boot camp. Check it out. Also learn about clickfunnels. It’s a pretty powerful marketinh tool. I’ve been building salesfunnels recently and they’re working well.